The first launch of Japan's newest rocket, the next-generation Epsilon booster, hit a major last-minute snag Tuesday (Aug. 27), forcing the country's space agency to abort the spaceflight 19 seconds before liftoff. 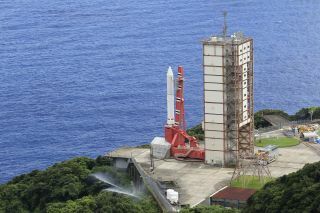 The glitch occurred extremely late in the countdown for the Epsilon rocket, which was slated to blast off from a seaside pad at the Uchinoura Space Center in southern Japan. The rocket was set to launch Tuesday at 12:45 a.m. EDT (0445 GMT), which was 1:45 p.m. Japan Standard Time at the launch site. "Today's launch was cancelled," JAXA officials wrote in a Twitter update. "More details will be reported as further information becomes available." A later updated from JAXA stated that the launch abort occured "because an automatic stop alarm was issued as an attitude abnormality was detected approximately 19 seconds prior to the liftoff time during the automatic countdown sequence." The cause of the abort alarm is under investigation, JAXA officials added. JAXA's Epsilon rocket is a three-stage rocket that stands 78 feet (24 meters) tall and is solid propellant. The rocket weighs 91 tons and is designed to launch satellites weighing up to 2,646 pounds (1,200 kilograms) into low-Earth orbit. The rocket's two upper stages are based on Japan's M-V rocket launch vehicle, which was retired in 2006. Artist's conception of the SPRINT-A spacecraft. For its first mission, the Epsilon rocket is carrying JAXA's Spectroscopic Planet Observatory for Recognition of Interaction of Atmosphere (SPRINT-A) satellite, an orbital observatory designed to study the other planets in the solar system. JAXA officials have touted the SPRINT-A satellite as the "world's first space telescope for remote observation of the planets such as Venus, Mars, and Jupiter from the orbit around the Earth." The launch was originally scheduled for Aug. 22, but was delayed to allow JAXA engineers time to address concerns with the rocket's ground support equipment. The Epsilon rocket features autonomous systems to conduct its own status checks in order to cut down on the amount of time and people required to track the rocket's health during launch. Its launch controls are also streamlined, allowing them to be overseen by laptop computers, JAXA officials have said. In a rocket description, JAXA officials said the Epsilon rocket is aimed at enabling more frequent rocket launches by lowering the operational costs of missions. "Through increased launch opportunities, we anticipate that space development activity will increase," JAXA officials state in an Epsilon rocket description. "The biggest goal of the Epsilon Launch Vehicle is to make space more accessible as rocket launches are made easier." Editor's note: This story was updated to include new comments from JAXA on the cause of the abort and correct the payload capacity of the Epsilon rocket.